Jupiter is the reigning heavyweight among the planets in our solar system so it just makes sense that it also possesses the most natural satellites. Over the past year I have been gleefully telling people that Jupiter has 69 moons (usually to a shocked response, occasionally to a giggling one) but now I must admit that I was quite wrong—Jupiter is now known to have 79 moons, ten newly discovered along with two previously announced in 2017 confirmed. The new moons are all quite small—only one to three kilometers across—and orbit Jupiter far beyond the four well-known Galilean moons. 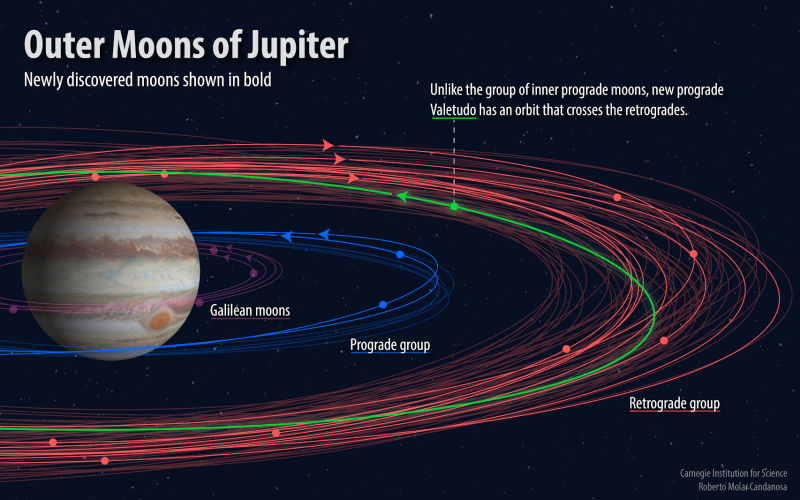 One of the moons is being called an “oddball” due to the fact that it orbits in a prograde direction (the same direction that Jupiter rotates on its axis) but is regularly found amongst Jupiter’s more distant retrograde moons during the course of its year-and-a-half-long orbit. This 1-km-wide moon is being called Valetudo after the Roman goddess of health and a great granddaughter of Jupiter. The moons were discovered by a team of astronomers searching the far reaches of the solar system for direct evidence of a massive world beyond Pluto…the “Planet Nine” proposed by Mike Brown and Konstantin Batygin in 2016. Jupiter just happened to be within the field of view, so they took a look to see what they might find. So if the moons were spotted in 2017, why are we all just hearing about them now? Read more about this discovery and how it was made on the Carnegie Institution for Science website here.